In this post, and in a series of further posts over the coming months, we will be focusing in particular on two important document accessibility themes. The first of these themes is that, from an accessibility point of view, all document formats have their strengths and weaknesses. PDF, Word and HTML (web and EPUB) each have advantages and disadvantages relative to other formats, depending on the nature of the content in question and the requirements of the reader. We will look at some specific examples. A second theme, which will come up again and again, is that in order to ensure that your documents are fully accessible, you may need to go much further than simply complying with standards. Similarly, we will argue that it is essential to test documents with multiple assistive technologies (ATs), not just screen readers. In previous posts we have begun to address a number of issues relating to the second of these themes. In some posts we have done so directly, such as in Fixing justified text in InDesign, and PDF/A accessibility issues. In others we have done so indirectly, such as in Accessible PDF footnotes and endnotes. Here we will take a first look at another important but often overlooked accessibility requirement which is that PDFs need to work properly for users of ATs that don’t read PDF tags. There are several important ways that PDFs, if not authored correctly, can contain accessibility problems for non-tag-reading ATs that may not show up in a screen reader test and/or a standards compliance test. One such problem is reading order. Like many other ATs, the popular literacy software solution Read&Write Gold (see GOV.UK assistive technology survey 2016) does not take the order in which it reads a PDF’s content from its tags. This is one of the reasons why a PDF’s reading order must also be correct in Acrobat’s Order Panel, and in some cases in Acrobat’s Content Panel also (much more on which in a forthcoming post). There are two different ways to read a PDF with Read&Write Gold’s PDF Aloud. By default, Read&Write Gold opens PDFs in its own reader. 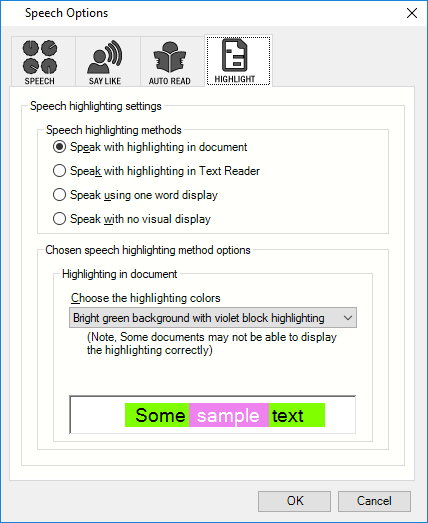 This provides text to speech with highlighting. It also allows page resizing as well as navigation via bookmarks and page up/down buttons. Unfortunately, this mode does not support PDF form fields. The alternative is to use Read&Write Gold from within Adobe Acrobat/Reader. Doing so has several advantages, including greater flexibility with colour customisation and support for form elements. In either mode there is a bug that readers may need to be aware of. By default, Read&Write highlights the currently selected paragraph or sentence in yellow (with black text), with the word currently be read rendered in white against a blue background. On web pages this works fine but in PDFs the text remains black (against the blue background) which is hard to read. Click the Play button down arrow. From the dropdown, select Speech Options. 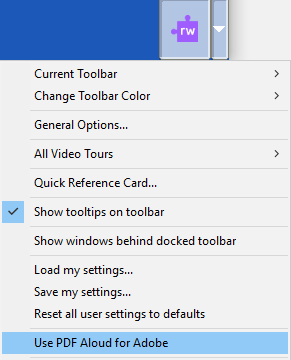 In the Speech Options dialogue box choose the Highlight tab. Then, from the Choose the highlighting colors dropdown select your preferred colour scheme. One that generally works well is Bright green background with violet block highlighting. In a PDF, because of the bug mentioned above, the text will be rendered in black against the violet background rather than the white as seen in the above screenshot. But this combination of black on violet gives a healthy colour contrast ratio of over 9 to 1, which will work well in most cases. In a number of forthcoming posts we will expand on both of the key themes identified above, together with more testing tips for non-tag-reading ATs. Alternatively, please check out our Accessible PDFs from Acrobat and Commissioning accessible PDFs training courses, both of which include modules on testing PDFs against the relevant standards as well as with multiple ATs.